Hello dear decor8 readers! 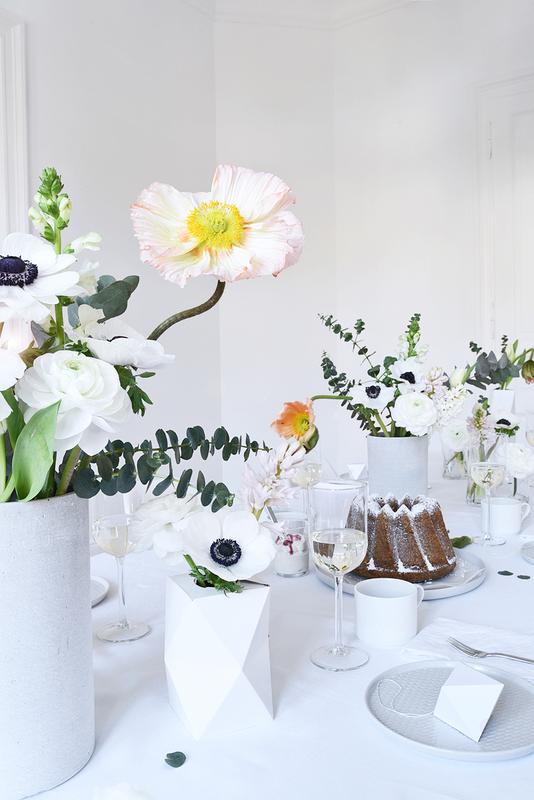 If you are in the mood for a minimalist and bright table decoration with flowers that, yay!, announce spring... come along! This is Anke with a new column for the month of February where I want to show you how uncomplicated a little party at home can really be. In this column, I want to show you five (5) easy steps to a very nice party for your friends. It can be to celebrate anything, but also to celebrate nothing in particular except to have a nice excuse to host friends. First, my table is laid in foundation white and grey colors this time giving the setting a very fresh look. Geometrical shaped vases as well as the ones with a concrete surface emphasize the clean and modern visual appearance. It's easy to go with tons of white because it's very easy to source, in fact most of us have white dinnerware and some white vases in our cabinet. You can mix and match shapes and textures very easily if everything is in the same tone of white. Think of a little something small to give to your guests. In order to repeat the geometrical theme, I folded white paper Octahedron pendants for every guest to take home after the gathering and placed these on the cake plates. I used pink adhesive dots to add a little color. You will find a lot of different instructions/ templates for geometric shapes on the internet! I discovered the one I used on this site. In Germany, we like to hang little ornaments on branches to decorate our homes during Easter, so this gift gives my guests something they can use on their branch during Easter, for instance. I always like to pick flowers that set the tone of the party, the color of the flowers create the palette for this tabletop since my vases and plates are white. You can do the same, let the flowers dictate the palette, makes it very easy! My heralds of spring are white Anemones, white Ranunculus, pale pink and white Hyacinths, slim white Tulips, Eucalyptus sprigs and huge Poppies. I simply arranged them loosely in different vases, without planning. Only for the wreath I proceeded with a little bit of a system. Isn't the salmon colored Poppy an uncontested show stealer?! I always like to make a little something for the wall nearby to the table to repeat the theme from the table to the wall somehow. You can try something similiar. The beautiful white wreath ring from danish manufacturer Strups was a Christmas present of a dear friend of mine. It is such a toy for every decoration enthusiast and can be ordered in two sizes and different colors. You don't have to lay out a roast that you spent a day preparing! Try to think smaller, but handmade and special. A simple cake will do with a pot of coffee or tea and some prosecco to make it a bit festive (we add prosecco to everything in Germany to give it a festive feeling - including brunch!). For my party, I made a moist Austrian Mohnkuchen Gugelhupf (Poppyseed Bundt Cake) I served with Lingonberry Whipped Cream, yum. If you google, look for "Austrian Mohnkuchen Gugelhupf" or "Poppyseed Bundt Cake". So let's review. You have your tabletop planned with white ceramics, glassware and white vases, with loosely styled flowers in each vase. 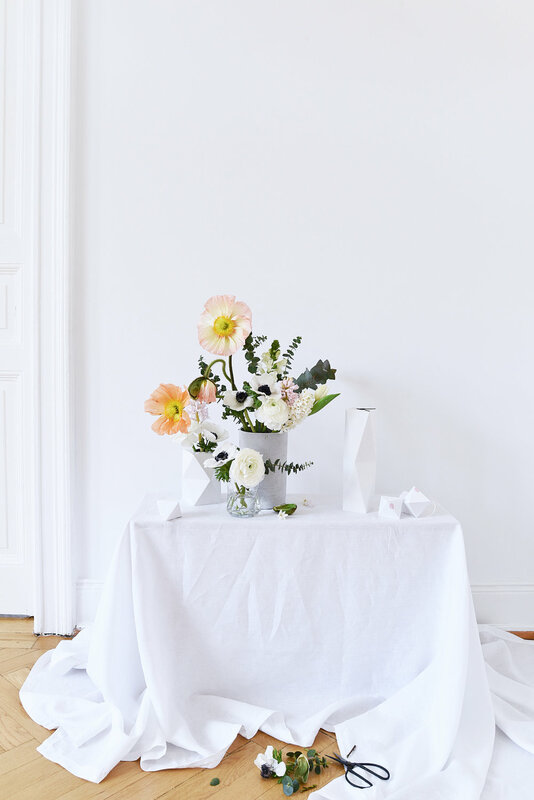 You've made a simple hostess gift for each guest out of paper. You've made a small wreath for your wall using the flowers from the table. You've added a nice homemade cake to the table with some sparkling wine. Now, you could add some tealights, a soothing playlist and great conversation and you have a perfect little party for your dear friends. That wasn't so hard, was it?